Hopefully this fixes the issues with there ever being any horizontal scrolling. Horizontal scrolling == extremely bad! Thanks, but I still prefer this. When there is a really wide system table for results? Is that the case you're referring to? Unfortunately that old design isn't mobile friendly and most people back then didn't like it. Could you post a screenshot on that please? There's a small issue that existed even in the old Phoronix and the current one as well. If you click "6 comments" under an article on the front page, or under an article, it opens to a random forum post in the accompanying thread. It should either open to the first post or the last unread post, if you've been there before. Most of the time it opens somewhere in the middle, on the Nth page etc. I hope this will be fixed in the new version. Horizontal scrolling is a web design faux-pas. Rather, it's bad for a site to scroll both horizontally AND vertically. Things should scale, or if they *MUST* horizontally scroll, like an image, you tap on it to open the image by itself so you can scroll and horizontally scroll just that element. I noticed your mobile screenshots showing the ads going off the edge, meaning that your adverts require the user to horizontally scroll to see them, when it really should have been restricted to the width of the screen and the advert scaled back. I think the complaints are about the forums taking ages (well, more like... seconds) to resize to fit a smartphone screen after loading. Might be a js thing, I am note quite sure. The other complaints are about Images being too wide for the page on small screen devices, or the system information for your benchmarks. IIRC, you are using flash to display benchmark results. This doesn't work on all mobiles phones. 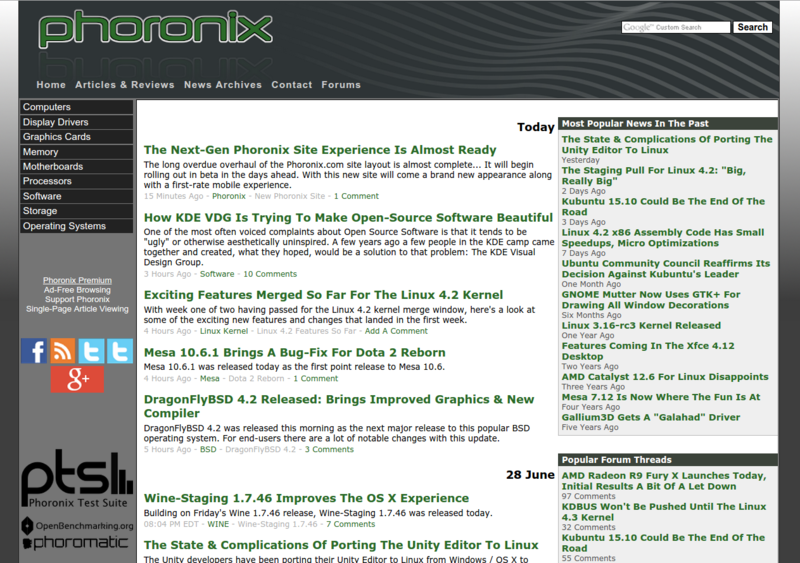 Big thank you to Google for this new phoronix layout :P (Just kidding... But we should see more mobile-friendly websites soon).